US Steel is trying to deannex a 2,000 acre tract of land in the northeastern part of Birmingham city limits. They want to build a large residential development that would include a commerial part as well that would remain in Birmingham. They claim that they are the city signed a 9-year contract the land from eminent domain of another city or Jefferson County. US Steel argues that the contractual agreement has expired and they are now eligible to deannex from the city. IMO, this is just a bunch of mess. It seems to me companies like US Steel want their cake and eat too. It doesn't work that way if you want to build the development help Birmingham gain more city residents. City and US Steel come to legal agreement over the land. Birmingham will allow the company to deannex the land, but US Steel promises to keep the commercial development within city limits. Which city/neighborhood/unincorporated area will be next to be annexed in Birmingham? There's actually quite a bit of unincorporated land in western and northern Jefferson County. If I were betting, I'd say the area between Graysville/Adamsville and Fultondale will be one of the next areas annexed. The area will probably really begin to see some growth once I-22 comes through that section. In terms of cities I could see as reasonable options for future annexation would be: Tarrant, Midfield, Fairfield, etc. I think annexation is a real way to both improve the image of "Birmingham" by including some regions outside of the older city limits as well as stopping the bleeding in terms of population loss. For example, most people don't think about or realize that sections of US280 (including The Summit) are actually within Birmingham city limits. Of course, city hall needs to get its act together and improve service to its citizens (better fire protection, school system, and police protection) in order to serve a larger area. Mainly, there's just a lot of land out there in the county right now (much of it unincorporated). Hopefully city leaders will have the foresight that their predecessors had in securing that bit of land around US280. 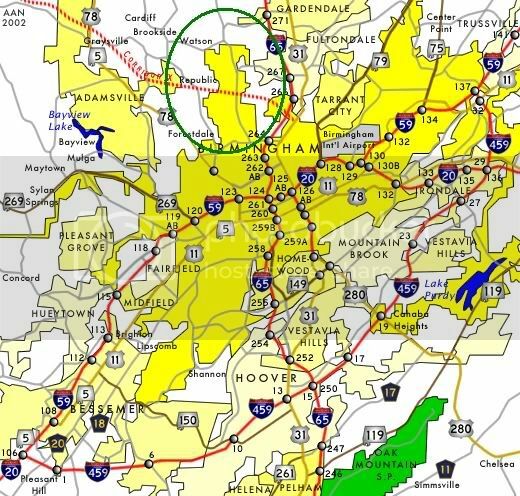 I have a feeling that northwestern area of Jeffco you just mentioned is going to be the next annexation of Birmingham. However, I have taken a number of engineering courses and know that area is also home to a vast number of abandoned coals mines. It's clear to me that to the northwest and/or northeast lie the most opportunities for annexation of UNINCORPORATED lands. In terms of annexation of other smaller suburbs, I would look to Tarrant, Midfield, Brighton, Lipscomb, Center Point, or Fairfield. It's clear to me that to the northwest and/or northeast lie the most opportunities for annexation of UNINCORPORATED lands. In terms of annexation of other smaller suburbs, I would look to Tarrant, Midfield, or Fairfield. Does anyone know if Alabama has a process for the annexation of existing municipalities? I added the green circle on top of the area I expect to really see some explosive growth in the coming years. Situated on the edge of Gardendale and Fultondale, this portion of the city limits of Birmingham feels far enough away for people to not feel like they're living "downtown." Growth in Fultondale and Gardendale is really starting to spill over. Probably 2,000 new homes coming online in Fultondale in the next couple years... probably 3,000-4,000 for Gardendale in the next couple of years. With I-22 (Corridor X on the map) coming through there in the coming years, it will only fuel that growth and push it over into some areas of unincorporated Jefferson County and extreme northern sections of the Birmingham city limits. Again, if I were Birmingham city leaders looking to get in on the ground floor of something, I'd look for there. May or may not have alot of commercial development associated with it, but certainly will see a big population boom in that area. I'm sure there is a process, but I don't really know it... I'd be interested to know if others have details. One of the main reasons of me creating this topic is simply to put the thoughts out there on annexation. It's been quite some time since Birmingham has annexed any significant lands/neighborhoods. Birmingham doesn't seem to be in the business of active annexations like some other cities in the Southeast and Alabama. This could, however, become a VERY important issue and I'll tell you why. Mobile is now (and for a while) been contemplating an attempt to annex West Mobile into the Mobile city limits. Doing so would raise Mobile's city population from 3rd-largest in Alabama with 191,000 to 1st with 245,000. Such an event could have severe effects on efforts to really push the city forward. So in part as a preventative measure and in part for helping advance the city anyway, Birmingham needs to look for some viable annexation options NOW before such an effort in Mobile could succeed. I don't know really what chance they stand in Mobile moving to annex West Mobile, but it definitely couldn't hurt Birmingham to already be thinking of a counterstrategy of their own. I've been wondering why the city doesn't annex the land for Corridor X (I-22), and the land for the proposed I-459 North (Northen Beltway) right-of-way. It seems that Birmingham could benefit TREMENDOUSLY if all that were in the city limits. I have no problems with another Summit or even a Galleria-type development (what goes around comes around. Malls will be en vogue again someday) at the intersection of I-22 & I-459 N.
Also, the city is in dire need of new neighborhoods. If I were mayor, I'd relocate the neighborhoods wedged between I-20/59 & Messer-Airport Hwy, open up all that land for more industry, and place the relocatees (!!!) on the north side of Norwood, with better access to jobs, fresh land, trees, infrastructure ( !!!) and less pollution. One of the reasons why the City of Birmingham hasn't annex anymore land is because most developers (residential) won't the land to be deannex so the new residents doesn't attend the Birmingham City Schools. Birmingham and a developer in eastern Jeffco had to case where the City was arguing that the entire development should stay in the city limits, but in 1998 the City signed an agreement to deannex the land if developed (residentially) and leave only the commercial portion. So after that case being settled in April, I highly doubt there will be anymore annexations with the intentions of adding new residents by Birmingham anytime soon. The only land that Birmingham has annexed is commercial. At this point, I highly doubt they will be annexing any land along the I-22 cooridor unless it is commercial at this point. One of the ways the City could solve some of these problems would be to fix its school district academically, but unfortunately the current School Board is too stubborn to want to allow this. Also I forgot to add, the City of Birmingham has new neighborhoods that have developed in the last 5 years in the Oxmoor Valley.